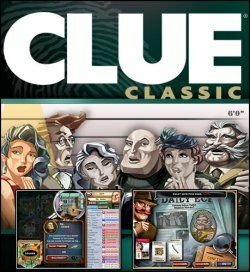 Clue Classic is a new casual game that brings the classic mystery game to your computer. The new game captures the essence of the much-loved Clue board game. Casual gamers can now solve the mystery that’s kept everyone guessing for 50 years. In this contemporary spin on the classic family favorite, Clue Classic assembles all the usual suspects, including Colonel Mustard, Professor Plum and Miss Scarlet, in a stately Tudor mansion. Players are challenged to determine who killed Mr. Boddy and uncover the details surrounding the mysterious murder. There have been a number of computer versions of Clue over the years, and Clue Classic is one of the best, bringing the old favorite up to speed with modern graphics and gameplay conventions. Clue Classic is styled as a “casual game”, meaning a quick-play format that fits easily into busy schedules, providing a method to relax, recharge, or simply pass the time with an entertaining challenge. Clue Classic is simple to learn yet challenging to master, with intriguing challenges, a compelling story line, and visually-stunning graphics. This is a classic whodunit that players will love to solve again and again.